Quick Search enables you to find the particular item you are looking for in a fast and simple way by performing a smart search with a minimum typing. The Quick Search function narrows down your query and provides a quick navigation between the menu items by specifying keywords, phrases, or field values. Globally — Navigate to System > Configuration in the main menu. Per organization — Navigate to System > User Management > Organizations in the main menu. 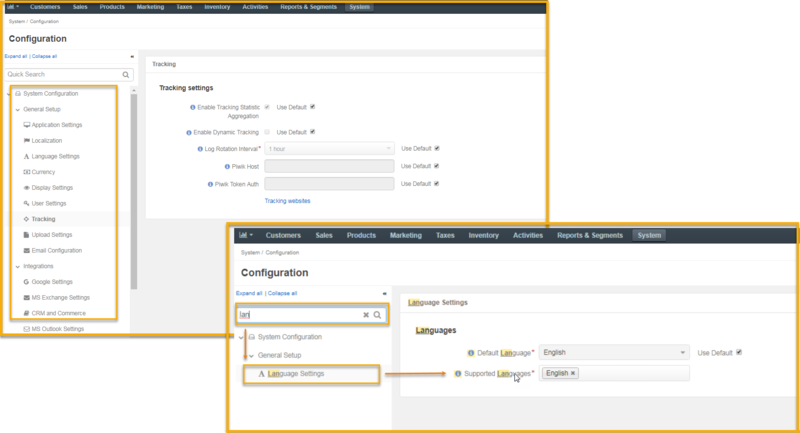 Hover over the More Options menu to the right of the necessary organization and click to reach the configuration page. Per website — Navigate to System > Websites in the main menu. Hover over the More Options menu to the right of the necessary website and click to reach the configuration page. Per user — Navigate to System > User Management > Users in the main menu. Hover over the More Options menu to the right of the necessary user and click to reach the configuration page. As an example, let us find the Language Settings menu via the Quick Search field. The menu resides under System Configuration > General Setup in the left panel. Start typing language in the Quick Search field. Only the items with the language in their titles will be displayed and highlighted upon your request. Click the necessary menu item to view the related settings details. To remove your query, navigate to the Quick Search field and clear the content by clicking .